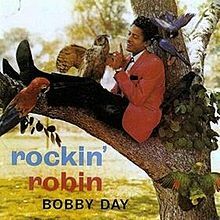 Rockin’ Robin. It’s a classic hit… in more ways than one! This is Sandra Tsing Loh, with the Loh Down on Science. Songbirds pass down tunes that can long outlast any one bird’s lifetime. In fact, people have recorded melodies that are exactly the same, but tweeted decades apart! But how do bird TWEETS go VIRAL? Stephen Nowicki of Duke University has an idea. He used mathematical models on songs of male swamp sparrows to test dueling theories. The verdict? Birds don’t learn their tunes from the cool guy with the best nest. Nor do they select the prettiest songs. Instead, analysis found that male sparrows are total COPYCATS! They sing the tunes most POPULAR within their community, like we do with our fave pop songs! Their mainstream musical taste attracts the ladies. Next thing you know, hatchlings are growing up with an age-old hit ringing in their ears. And when they begin to sing, they stick to the hits! The cycle continues, with songs passed down like the oral traditions of human cultures. Nowicki’s model predicts these hits might stay popular for over five hundred YEARS! So, step aside BILLBOARD one hundred! AVIAN one hit wonders never leave the charts!